Western Digital Scorpio Blue model WD5000BEVT 500 gig vs the Toshiba MK6034GSX in my Macbook Core 2 Duo 1.83 ghz, GMA 950 graphics. On paper, these drives look similar. 5400 RPM, 8 Gig cache, 12ms seek times. So, you think they'd perform pretty much the same eh? Well, what you and I forget dear reader is the data density. WD 500: I'm your density! The WD has 2 platters, the Toshiba has one. Still, that's 250gigs per platter vs 60, so over 4 times the data density. How does that translate to performance? We got the benchmarks. Random Write. 106MB/sec peak. Granted, this is probably into the cache but once again, we're beating a Mac Pro overall. Random Read. 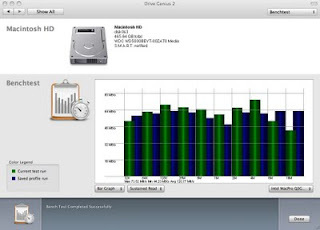 This is the only test where the laptoppiness of the drive shows, and this is an older Mac Pro model, but still. In short, for around $80 street price, it's a worthwhile upgrade. I got mine for $72ish shipped from Dell. Toshiba benchmarks below, if you're curious. Keep in mind the graph scale of these is different, so look at the magnitude of the data, not the relative bar length. Note it lags far behind the same Mac Pro. Conclusion: Mainly, I did this upgrade for lack of storage space. What I got was a nice boost in speed. I have 3 gigs of RAM also, which makes a big difference. Remember folks, as it's proved over and over again, RAM and throughput make the system. I personally skimp a little on processor and graphics, and spend on the RAM and video card. With enough RAM, even a slower disk won't hurt as bad. But when you can get a much faster drive for cheap, go for it.